Production: Argos Films-Como Films (Paris), Pathé Overseas, and Daiei (Tokyo); 1959; black and white, 35mm; running time: 91 minutes, some sources list 88 minutes. Released June 1959. Filmed September-December 1958 in film studios in Tokyo and Paris, and on location in Hiroshima and Nevers. Producers: Sacha Kamenka, Shirakawa Takeo, and Samy Halfon; screenplay: Marguerite Duras; photography: Sacha Vierny and Michio Takahashi; editors: Henri Colpi, Jasmine Chasney, and Anne Sarraute; sound: Pierre Calvet and Yamamoto, and Rene Renault; art directors: Esaka, Mayo, and Petri; music: Giovanni Fusco and Georges Delerue; costume designer: Gérard Collery; literary adviser: Gerard Jarlot. Cast: Emmanuelle Riva ( She ); Eiji Okada ( He ); Bernard Fresson ( The German ); Stella Dassas ( The Mother ); Pierre Barbaud ( The Father ). Awards: Cannes Film Festival, International Critics' Award and Film Writers' Award, 1959; New York Film Critics' Award, Best Foreign Film, 1960. Duras, Marguerite, Hiroshima mon amour , Paris, 1959; translated as Hiroshima, Mon Amour , New York, 1961; London, 1966. Cordier, Stéphane, Alain Resnais; ou, La Création au cinéma , Paris, 1961. Pingaud, Bernard, Alain Resnais , Lyons, 1961. Bounoure, Gaston, Alain Resnais , Paris, 1962. Ravar, Raymond, editor, Tu n'as rien vu à Hiroshima , Brussels, 1962. Cowie, Peter, Antonioni, Bergman, Resnais , London, 1963. Armes, Roy, The Cinema of Alain Resnais , London, 1968. Ward, John, Alain Resnais; or, The Theme of Time , New York, 1968. MacDonald, Dwight, On Movies , Englewood Cliffs, New Jersey, 1969. Bertetto, Paolo, Alain Resnais , Italy, 1976. Kreidl, John Francis, Alain Resnais , Boston, 1977. Monaco, James, Alain Resnais: The Role of Imagination , New York, 1978. Benayoun, Robert, Alain Resnais: Arpenteur de l'imaginaire , Paris, 1980; revised edition, 1986. Sweet, Freddy, The Film Narratives of Alain Resnais , Ann Arbor, 1981. Trastulli, Daniela, Della parola all imagine: Viaggio nel cinema di Marguerite Duras , Geneva, 1982. Etzkowitz, Janice, Toward a Concept of Cinematic Literature: An Analysis of "Hiroshima Mon Amour, " New York, 1983. Vergerio, Falvio, I film di Alain Resnais , Rome, 1984. Roob, Jean-Daniel, Alain Resnais: Qui êtes-vous? , Lyons, 1986. Riambau, Esteve, La ciencia y la ficción: El cine de Alain Resnais , Barcelona, 1988. Guillaume, Catherine, Trahir la passion: des égarements passionnels aux égards du traitement , Paris, 1992. Bersani, Leo, and Ulysse Dutoit, Arts of Impoverishment: Beckett, Rothko, Resnais , Cambridge, 1994.
" Hiroshima mon amour , film scandaleux?," in Lettres Françaises (Paris), 14 May 1959. Sadoul, Georges, "Un Grand Film, un grand homme," in Lettres Françaises (Paris), 14 May 1959. Delahaye, Michel, interview with Alain Resnais, in Cinéma (Paris), July 1959. Cahiers du Cinéma (Paris), July 1959. Marcorelles, Louis, Henri Colpi, and Richard Roud, "Alain Resnais and Hiroshima, Mon Amour ," in Sight and Sound (London), Winter 1959–60. Colpi, Henri, "Editing Hiroshima, Mon Amour ," in Sight and Sound (London), Winter 1959–60. Roud, Richard, "Conversations with Marguerite Duras," in Sight and Sound (London), Winter 1959–60. Colpi, Henri, "Musique d' Hiroshima ," in Cahiers du Cinéma (Paris), January 1960. Egly, Max, interview with Alain Resnais, in Image et Son (Paris), February 1960. Burch, Noël, "A Conversation with Alain Resnais," in Film Quarterly (Berkeley), Spring 1960. Weiler, A. H., in New York Times , 17 May 1960. Mekas, Jonas, in Village Voice (New York), 25 May 1960. Hart, Henry, in Films in Review (New York), June-July 1960. Alexander, A. J., in Film Culture (New York), Summer 1961. Labarther, Andre, and Jacques Rivette, interview with Alain Resnais, in Cahiers du Cinéma (Paris), September 1961. Hart, Henry, in Village Voice (New York), 4 October 1961. Kael, Pauline, "Fantasies of the Art House Audience," in Sight and Sound (London), Winter 1961–62. Durgnat, Raymond, in Films and Filming (London), May 1962. Stanbrook, Alan, "The Time and Space of Alain Resnais," in Films and Filming (London), January 1964. Le Troquer, J., in Téléciné (Paris), February 1973. Pór, P., in Filmkultura (Budapest), March-April 1973. Hanet, K., "Does the Camera Lie? Notes on Hiroshima, Mon Amour ," in Screen (London), Autumn 1973. Helman, A., in Kino (Warsaw), September 1974. Van Wert, W. F., "Point Counterpoint in Hiroshima, Mon Amour ," in Wide Angle (Athens, Ohio), no. 2, 1978. Mercken-Spaas, C., "Destruction and Reconstruction in Hiroshima, Mon Amour ," in Literature/Film Quarterly (Salisbury, Maryland), no. 4, 1980. Boer, L., in Skoop (Amsterdam), December-January 1980–81. Glassman, D., "The Feminine Subject as History Writer in Hiroshima, Mon Amour ," in Enclitic (Minneapolis), Spring 1981. Cardullo, B., "The Symbolism of Hiroshima mon amour ," in Film Criticism (Meadville, Pennsylvania), Winter 1984. Moses, John W., "Vision Denied in Night and Fog and Hiroshima, Mon Amour ," in Literature/Film Quarterly (Salisbury, Maryland), vol. 15, no. 3, 1987. Astala, E., "Hiroshima, rakastettumme," in Filmihullu (Helsinki), no. 1, 1990. Della Casa, S., "Amnesia land: il cinema del dimenticare," in Ikon (Milan), October 1990. Lane, N., "The Subject In/Of History: Hiroshima, mon amour," in Florida State University Conference on Literature and Film , vol. 15, 1990. Grange, M.-F., "Paysage resnaisien ou variations autour de la mise en espace du temps," in Cinemas , vol. 5, no. 1/2, 1994. Samson, P., "Le montage comme articulation entre reel et fiction," in Cinemaction (Conde-sur-Noireau), vol. 72, no. 3, 1994. O'Connell, Vincent, "The Human Heart," in Sight & Sound (London), vol. 6, no. 3, March 1996. Michiels, Dirk, "Onuitwisbaar oorlogsstigma," in Film en Televisie + Video (Brussels), no. 462, May 1996. 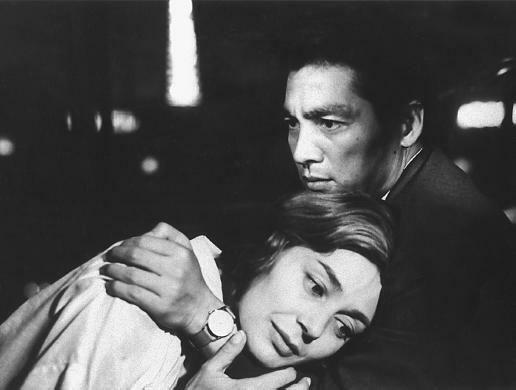 Hiroshima mon amour was the first feature directed by Alain Resnais. Besides establishing the director's international reputation, the film was one of several released in 1959 signalling the emergence of a new generation of French filmmakers working in a modernist narrative vein. Indeed, the film is considered something of a landmark in the history of modernist cinema. The film is also seen as an exemplary instance of artistic collaboration. The scenario by Marguerite Duras, photography of Sacha Vierny, editing of Henri Colpi, and musical score by Giovanni Fusco and Georges Delerue contribute to its dense patterns of repetition and counterpoint. In the film, an initially casual romantic encounter between a Japanese architect ("He"), and a French actress ("She") working in Hiroshima on a film about peace provides the basis for exploring the nature of memory, experience, and representation. The love affair is important primarily for the chain of memory it triggers, as the woman gradually discloses the story of her first love, a story she has never told before. During World War II, in Nevers, she fell in love with a German soldier. On the day the city was liberated, he was shot and killed. She was subsequently submitted to public disgrace, followed by a period of imprisonment and near-madness in her parents' home. She finally recovered enough to leave home permanently, arriving in Paris on the day the war ended after the bombing of Hiroshima and Nagasaki. This story is only revealed in stages, and establishes a complex of metaphoric relations between the past and present. The woman's first memory image is prompted by a direct visual comparison: the twitching hand of her sleeping Japanese lover resembles, and motivates a cut to, the twitching hand of the dying German soldier. This transition is a specific instance of a more complex network of comparisons constructed throughout the course of the film, a concise figure for the film's general pattern of development. A structure of metaphoric logic takes the place of the linear causality, clearly defined goals, and conscious motivation associated with dominant narrative. For example, the German lover from the past and Japanese lover in the present are comparable as former mutual enemies of France. At the same time, we see the woman victimized in the past for her relations with the German. Her victimization is likened to the victims of the atom bomb seen in the film's opening sequence in a series of images—documentary and reconstructed—depicting the effects of the bomb. These images of destruction and deformity include loss of hair and burnt, distorted skin. Later, we see the woman's head shaved in the public square in Nevers to mark her illicit "collaboration" and her skin broken and bloody as she scrapes it on the walls of her parents' cellar. While the woman is thus "like" the Japanese, a victim of the war's end, she is nevertheless liberated from her private torture, allowed to go free, at the same time the bomb is dropped on Hiroshima. Through the accumulation of images and narrative information, Hiroshima mon amour provides material for recognizing a complex network of comparison and contrast linking disparate events. As the film progresses, the terms of association become more abstract, a function of formal repetition, as tracking shots through the streets of Hiroshima are intercut with tracking shots through the streets of Nevers. Two places and times converge through the continuity afforded by the camera's point of view. At the same time the relationship between the man and woman in the present is infused with the potency of memory. The Japanese man asks the woman to stay in Hiroshima (not a viable option in any conventional sense, since she has a family in France and his wife is due home from a trip shortly), as she comes to emblemize the inconsolable memory of the past. Yet her story, once told, transforms the experience and its memory into the order of history. The woman acknowledges this shift in value. She confronts herself in the mirror and addresses her dead lover, announcing her betrayal. At one point, she refers to the event as a "two-penny romance," a common, even trivial affair. This change is a function of narration; having been recounted, the experience has undergone a change in nature. This is one way in which the film explores the nature of representation in relation to experience and memory. In the course of exploring this issue, Hiroshima mon amour clearly suggests that the mediated account, whether verbal or visual, is qualitatively different from, and supplants, personal experience. The very opening of the film promotes this view, challenging any easy equation of representation and experience. Images of the Hiroshima museum and its repository of documents are accompanied by a woman's voice saying she saw and felt everything in Hiroshima— the heat, the suffering, and so on. Voice and image seem to confirm and validate one another. But a male voice denies her assertions, insisting, "No, you saw nothing." The viewer not only wonders who is speaking, but also is forced to question the woman's certainty, and his own, about the nature of what he is watching. Seeing, in this way, may become misbelieving. If the woman's narrative of her past displaces the event as pure experience, the initial recounting is not an easy task. Bringing the experience to the level of verbal presence involves the painful eruption of the past ("inconsolable memory") into the present. Temporal distinctions get provisionally confused, and past and present seem to merge, as she first tells the story to her Japanese lover. Her language involves shifts in tense and pronoun use, as past events are spoken of in the present tense and the woman replaces the "he" of her story (referring to the past German lover) with "you" (an apparent address to her present Japanese lover). In this way the nature and act of narrating emerge as a further concern of the film. If the process of narrative is a personal and difficult activity, merging the speaking subject with event, the product eludes the control of the teller. The woman's deeply personal experience, once told, counts as a public story to be judged in the context of narrative history. For all of these reasons the film is seen to exemplify practices associated with modernist aesthetics. It rejects linear, causal narrative progression, constructs its characters as figures involved in the process of representation, and problematizes the nature of this process. The implications of this investigation extend beyond the characters in the fiction to include the film and its audience, as Hiroshima mon amour challenges the viewer to recognize the metaphoric relations that confer its coherence, and also to question the value and meaning of its own representations.